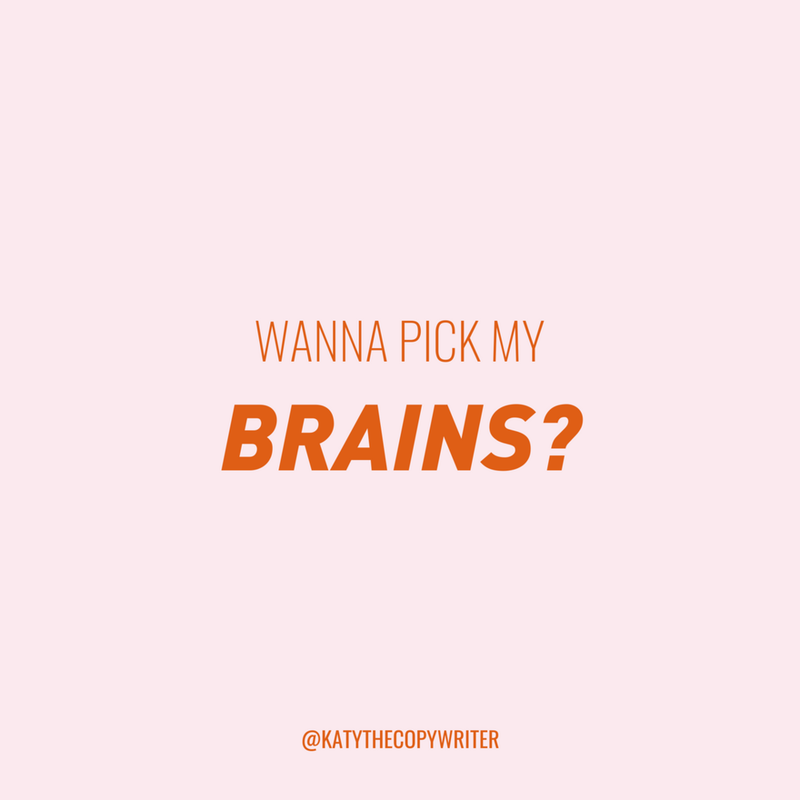 Freelancer goes to networking event and meets dreamy Potential Client... PC follows up the next day with a keen email, declaring how they’d love to pick Freelancer’s brains over coffee. Filled with glorious visions of landing a six-month contract, Freelancer instantly jumps at the chance, bending over backwards to accommodate PC in their schedule. Nope this isn’t the predictable plot line to some new sh*tty Aniston-meets-Stiller Rom-Com, it’s just a story that plays out every single fricking day in this glorious age of the gig economy. If you’re a freelancer, you’ve definitely been here before. If you’re a client who’s hired a freelancer, you’ve probably gone through this process, too. So why do I turn down these ‘let’s get coffee’ invitations? I’m social. I love getting to know people. And I’m a caffeine addict running on 3-4 cups a day, so any excuse right? I learned the hard way that free attracts free. A few months in to freelance copywriting, I had a crazy busy month, wrote a ton of proposals, but didn’t win any new clients. Now, I charge $$$ for those ‘follow-up’ meetings, and so should you. I know, I know. The vast majority of freelancers don’t / won’t / omg couldn’t possibly. But you’ve gotta believe me, here. Re-framing ‘getting coffee’ as ‘booking a consultation’ and then charging for your time will dramatically impact both the health of your business, and your own self-worth. When I’ve met a PC and am guiding them towards becoming my client, I’ll typically give them one of three options. 15-minute Discovery Call (free) — This is my free, no-strings-attached option; A ‘getting to know you’ phone call, typically following-up after a networking event, a DM on social media, or via a referral. It’s a chance for us both to ask questions, and to get a sense of whether we’re a good fit. During the call I’ll keep the conversation upbeat and fun, but also fairly general. I’ll refer to projects and results that I’ve worked on previously, but I won’t get stuck in to the ins and outs of the PC’s specific project. 60-minute Power Hour ($$) — This is my ok-lets-do-this option; If a client wants to seriously sit down and create a plan and/or proposal for their project, we book a Power Hour. This is where the real work starts, and where I’ll go big on dishing out advice, ideas and expertise. I make it clear that one hour of consultancy time requires three hours of my time; An hour beforehand, researching their business and critiquing what they’ve sent over for discussion; An hour during the consultation, delivering value, listening, and responding to the client’s needs; An hour afterwards, pulling together our notes or action plan and an individually tailored proposal. When you’re a freelancer, time is literally money. If you’re on the clock, but you ain’t getting paid, then what in fresh hell are you doing? For anything more than a ‘getting-to-know-you’ chat, you’re giving your expertise, focusing your time on the prospective client’s business, and delivering value for them - you need to find a price point for that. How many times have you spent an hour or more meeting with a potential ‘client’, only to finish up with them saying, “Ok, that all sounds great, let me just check with my boss…” and then they drop off the face of the planet? By incurring a small cost at the beginning of the process, you know that you’ve already got a thumbs-up in principle from the person holding the purse-strings. It’s very easy for an ‘initial consultation’ to turn into a nice coffee and a catch-up (especially tempting when you work from home a lot!) Don’t get me wrong, I love to go for coffee socially, but if I’m meeting a client to kick off a professional relationship, I want to make damn sure they think I’m hot sh*t from the word go. If I’ve charged them for their consult session, I am 100% accountable to make sure I deliver feedback and work with tangible value during that time. a) Turn up — because last-minute cancellations can really mess up your day. b) Turn up on time — because, and I’ll say it again, when you’re freelance, time is literally money. c) Turn up prepared, and focused — because they’re as invested in this time together as you are. You’ll probably find that you meet with fewer clients now that you’re charging for your time, but if a PC has no budget, I’d rather know before I go to the expense of creating a tailored proposal for them. If they ghost you after your consultation, that’s fine, too. Maybe they just wanted a second opinion on their homepage, or some quick tips to implement cheaply in-house, but were too embarrassed to say they didn’t want a full project. Bet you’re feeling good that you didn’t dish that advice out for free? By being totally transparent that your time requires the client’s money from the get-go, it massively helps in reducing the volume of late-night emails, Saturday morning phone calls, and demands for an 8th round of amends. By setting clear boundaries, you’re also letting your client know that when you’re on their time, they always have your undivided attention and focus. With all that paid time in the bank, I’ve now got the space to offer special freebies to my repeat customers once in a while. Wouldn’t you rather offer a seasonal discount, or a free workshop to your loyal clients, instead of the people you don’t end up working with getting all the goodies. Seems only fair, right? You’re offering value and delivering great-quality work from the very start. Your client is fully invested in your design/ marketing/ copywriting/ fitness-training/ business mentoring process from the start. Put simply, this is a great way to start your working relationship. Don’t let a PC ‘pick your brains over coffee’, even if they offer to buy. A macchiato with a pump of vanilla will not pay your rent. Re-frame ‘brain picking’ as ‘sharing your expertise’. Remember, the PC wants your input for a reason - you’re an expert - and what you have to share has value. Offer a few different time and price commitments to take care of PCs who are cautious, super-ready to start, or somewhere in between. Take the lead and own your process. Practice your own way to segue from turning down a coffee date to booking a paid consultation. Be prepared that people will say no. And that’s ok. Learn to view every time you get turned down for a paid consult, as dodging a bullet from a freebie-hunter. Wanna pick my brains? Book a call. Want to implement paid consults into your freelance business, but struggling to find the right words to pitch yourself? Let me help you. Book a 30-minute Disco Call with me, and I’ll show up with specific tips on what to say and how to say it.